SNAFU! : Maduro assassination attempt. You're talking politics, I'm trying to figure out counters to their countermeasures! 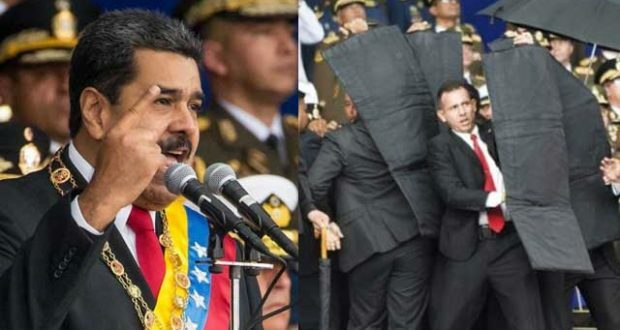 Maduro assassination attempt. You're talking politics, I'm trying to figure out counters to their countermeasures! I've watched about a half hour of coverage of the Maduro assassination attempt. I've read a few threads regarding it and most are doing as expected. Talking about the politics of thing. Debating the policies of the govt and trying to figure out how long they'll survive. I'm watching the vid trying to figure out counters to the security details countermeasures! Do you want to know why the Secret Service or any other professional on a Protection Detail works overtime to prevent even an attempt? Simple. Because when you have to start going live (take active measure to prevent death or injury) to protect the principal then you've already lost. So while everyone is watching the stunned face of Maduro, I was watching his detail. How fast they moved, what they did...I tried to get additional anges to see if overwatch remained in place and was actively scanning or moving to vehicles so that they could all ditty bop away. I don't know who made this attempt but even though they did not succeed in getting the "kill" they now have more information on how to be successful the next time. Maduro better hope that his security forces capture each and every perpetrator and that they're not professionals. If they have even rudimentary training he's the walking dead. They got valuable information on how they do things. Unsuccessful attempt? They got the Cliff Notes on how the protection detail works. They lost but won at the same time.